Those are the undead enemy…! Panel 2: A second speech bubble from the AUL chairwoman extends from her first speech bubble in Panel 1, “Tomorrow will be a week since the dead began rising, what the yellow press is calling the ‘Zombie apocalypse. '” Behind this speech bubble is Margaret, who was seen on Page 1 in the center of the audience; she’s sitting silently with eyes reddening and a sickly greenish hue to the face. 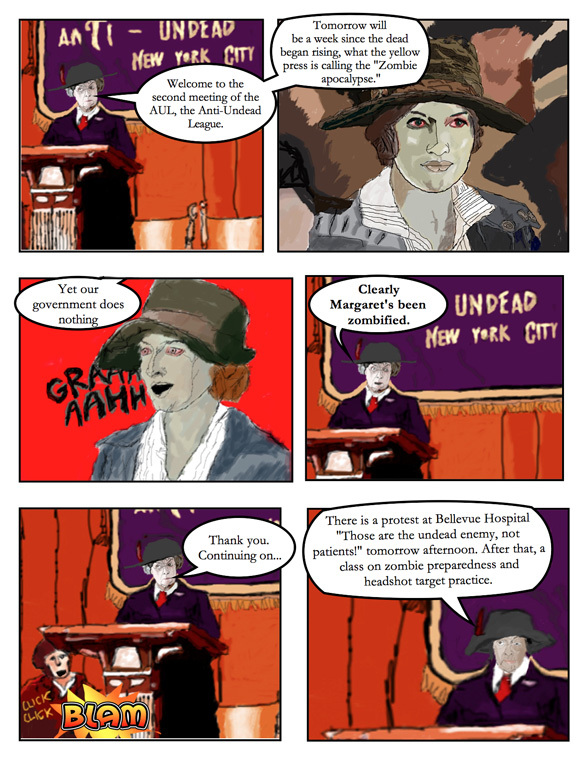 Panel 3: The chairwoman continues, “Yet our government does nothing!” Behind the speech bubble, Margaret has become a zombie, her eyes a demonic red. She’s going “GRAAAHH” in zombie hunger; in fact, she’s zombie-ing so hard, she’s turned the entire background red.